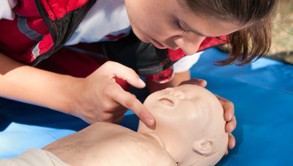 This is a non-certification class following the guidelines and techniques of the American Heart Association for performing CPR and how to respond if your baby is choking and/or not responding. Hands on practice performing infant CPR. The steps to take if your child is not breathing. Discuss home safety and how to baby-proof your home. Learn the 5 W's to call for help.